Ask any serious musician and they will tell you that their instrument of choice feels like a natural extension of their own body. For media artist Dmitry Morozov, that is true in a literal sense. 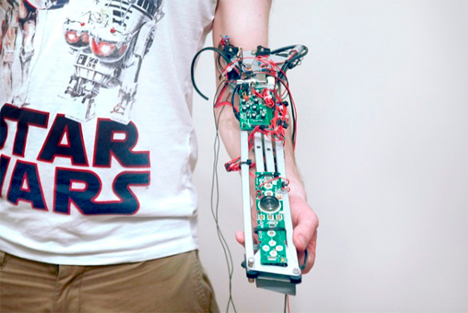 He created an instrument that reads a tattoo on his arm as a musical score. 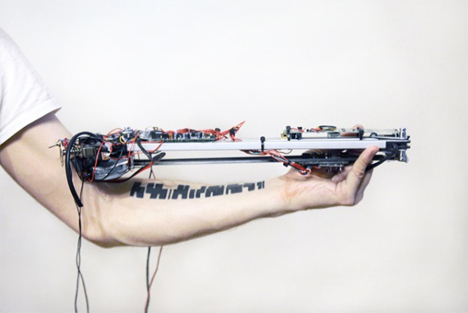 Along with a device that mounts onto his arm, the tattoo makes Morozov into a kind of cybernetic musical instrument. The Tattoo Sound Controller consists of a handle and two rails, along which move sensors. 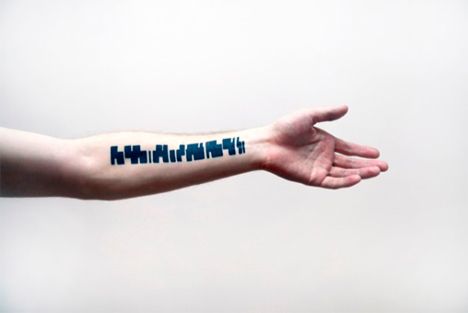 The sensors “read” the black shapes of Morozov’s tattoo and translate them into sounds that remind us of a garbage truck, or perhaps someone hitting piano strings with a wrench. The tattoo is specifically designed to leave the maximum amount of time between “triggers” so that the instrument is as flexible as possible. The speed, direction, and step length of the sensors can all be adjusted so that, according to Morozov, there are an infinite number of variations on the sounds. A Wii controller in the handpiece allows Morozov to move his hand in three dimensions and create new and interesting sounds simply by changing up the speed and angle at which the sensors read the tattoo. According to the artist, this creative hybrid of human and machine represents the melding of the artist and his instrument.